AYR Racecourse has appointed Emma Marley as Clerk of the Course. Emma will assume her duties from early May but, also be in attendance at the Coral Scottish Grand National on Saturday 17 April to allow her to get a feel of the course. Emma, 30, (pictured above) is a graduate of Warwickshire Agricultural College where she gained a BA (Hons) first class degree, and is also a BHA Development Programme Graduate. Currently Clerk of the Course at Bath for Northern Racing Ltd, Emma has long and varied experience in the racing industry, and has also worked for Northern Racing in their commercial departments at Chepstow and Hereford. 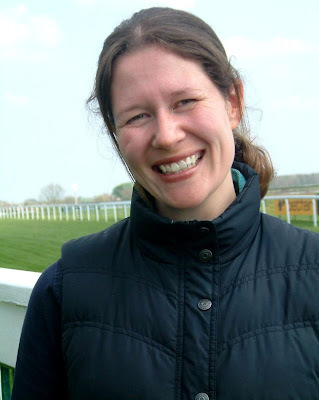 Prior to this Emma has worked as assistant trainer, racing secretary, work rider and has also trained her own point-to-point horses. Emma commented: “I have thoroughly enjoyed my time working with Northern Racing, and I am grateful for their investment in me over the years. Emma replaces Hazel Peplinksi, who has been Acting Clerk of the Course at Scotland’s premier track since last August, after the then Clerk Katherine Self left to take up a post with HM Coastguard. Ayr Racecourse is Scotland’s premier racecourse. It is home to the Coral Scottish Grand National in April, and the William Hill (Ayr) Gold Cup Festival in September. As a dual purpose track, holding both National Hunt and Flat fixtures, Ayr Racecourse stages year-round racing, with 27 days racing to choose from in 2010. The next fixture is the Coral Scottish Grand National Festival on Friday 16 and Saturday 17 April. Click here for more details. There are currently 684 Ayrshire business stories permanently archived on this site. To locate those of most interest to you, please use the site search facility in the top left hand corner of this page. Type your search term in the white box, then click the magnifying glass symbol.